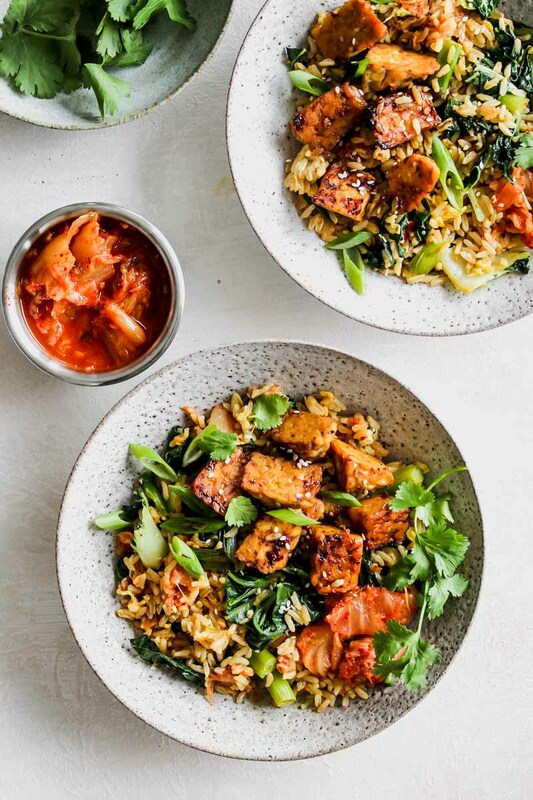 Kimchi fried rice with sesame-braised tempeh is a speedy, better-than-takeout option for busy weeknights. Fried rice takes me back to some supreme college memories. What some folks may not realize about fried rice is that it’s a multipurpose food. 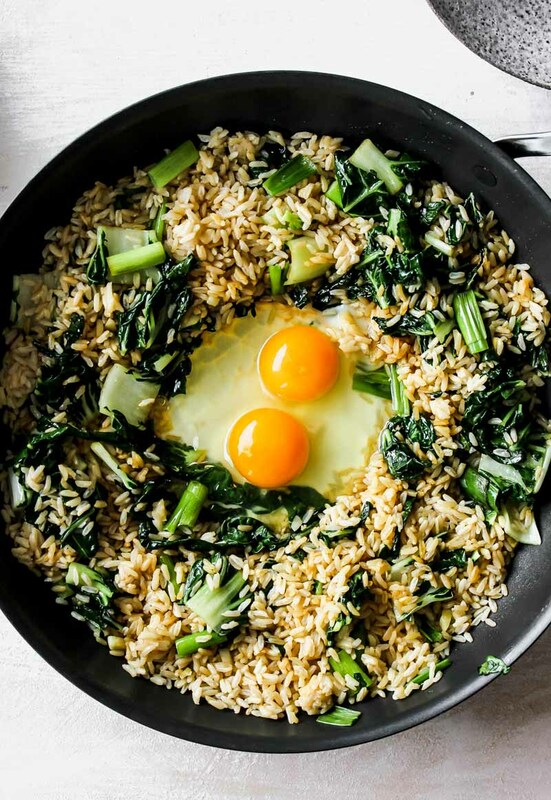 Of course it’s delicious when delivered to your door at midnight after happy hour turns into a one-too-many-vodka-soda marathon, but it’s arguably even better the next morning crisped up in a skillet adorned with a couple fried eggs. I like to think that this recipe captures all that, sans hangover and regrets. Really the only regret you may have after making this is that you didn’t double the batch. If you’ve never tried tempeh before, this is your moment to give it a whirl. 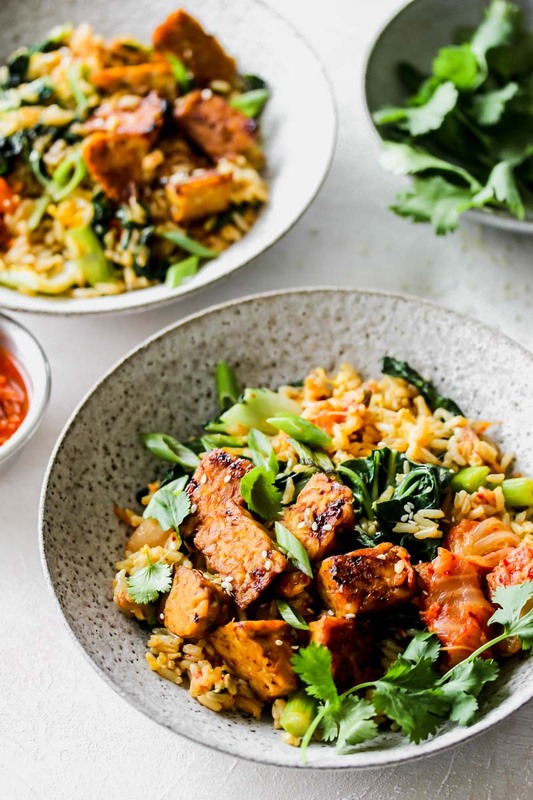 It’s made with fermented soybeans and a mix of whole grains, which gives it its hearty, chewy texture and inherently nutty flavor. 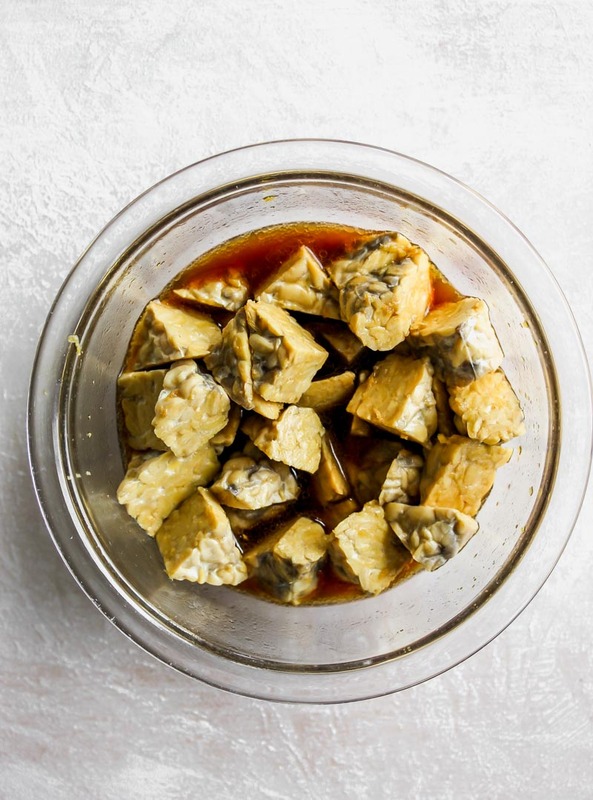 Since tempeh is fermented, it comes equipped with a dose of probiotics that makes this soy product easier to digest than others. It’s also higher in fiber than tofu, plus a decent source of iron. 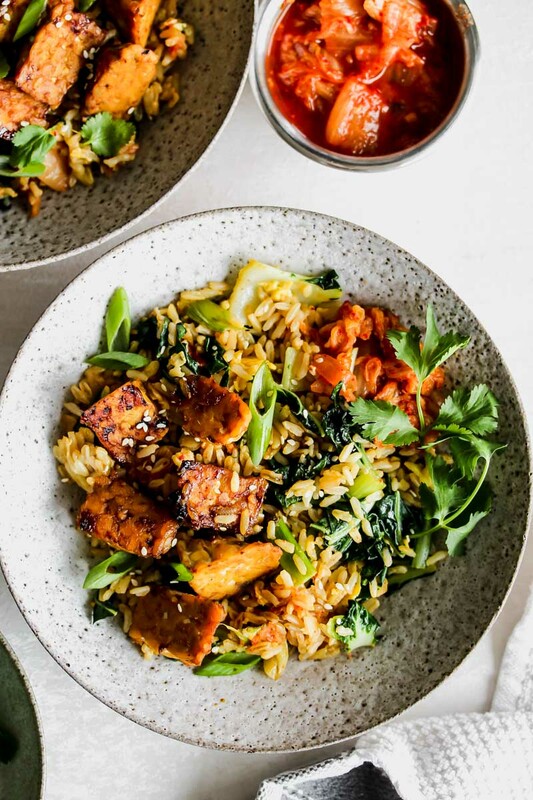 Braising the tempeh in an umami-heavy marinade gives the whole dish a deeply savory quality that’s reminiscent of meat. (Oh, the meatless places you’ll go!) The crispy edges also come in clutch, giving the whole dish a texture boost. And I’ll let you in on a little secret: The best fried rice is made with either leftover rice, or the microwavable bags of rice. Mainly because moisture is the enemy here, as it interferes with the rice reaching maximum crispiness. If you’re into batch-cooking your grains, go ahead and cook a big batch of rice, chill it uncovered overnight (which helps dry it out), and it’ll be in top-notch shape to get crisped up in a skillet. If you’re using microwavable bags of pre-cooked rice, they’re already dry as hell as long as you don’t actually microwave them. Just use your hands to massage the grains in the bag to break them up, and toss them in the skillet. This is sounding superbly weeknight-friendly, huh? As far as the alliums and greens go, the options are highly customizable. Fried rice is pretty forgiving and will take on any flavor profile you throw its way. Shallots, mushrooms, scallions, kale, bok choy—throw it all in. Same goes for the toppings—fresh herbs, toasted sesame seeds, and kimchi (always, always kimchi) give it the final layer of texture and flavor to beat out anything served at the local takeout joint. And trust me, leftovers have never been better. 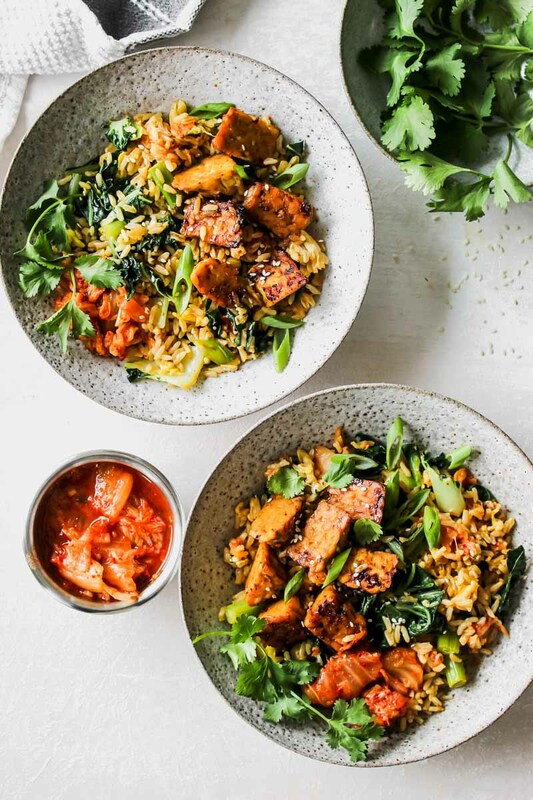 Kimchi fried rice with sesame-braised tempeh is a speedy, better-than-takeout option for busy weeknights. Place 2 Tbsp. of the soy sauce, water, sesame oil, vinegar, maple syrup, and ginger in a bowl; whisk to combine. Add tempeh; let stand 20 minutes at room temperature, tossing occasionally. Heat a large nonstick skillet over medium-high; add tempeh mixture. Cook 6 to 8 minutes, stirring occasionally, until liquid has been absorbed and tempeh is golden-brown and crisp. Transfer to a bowl. Add canola oil to skillet and reduce heat to medium. Add bok choy, green onion, and garlic; cook 4 to 5 minutes, stirring often, until bok choy is wilted. Add rice and sugar to pan, tossing to combine and spreading it so it covers the bottom. Cook, undisturbed, until rice begins to get golden and crisp. Use a wooden spoon to create a hole in the center of the pan. Add eggs to the center of the pan and cook, stirring occasionally, until eggs are almost set. Add remaining 1 Tbsp. soy sauce and tempeh; toss to combine.Stir in kimchi. Divide fried rice evenly into each of 4 bowls; garnish with additional green onion, cilantro, and kimchi, if desired.